Apple today opened up its Apple News Format to all publishers, giving independent publishers and individuals tools to offer rich media content within the Apple News app for iOS 9, as noted by Vanity Fair. 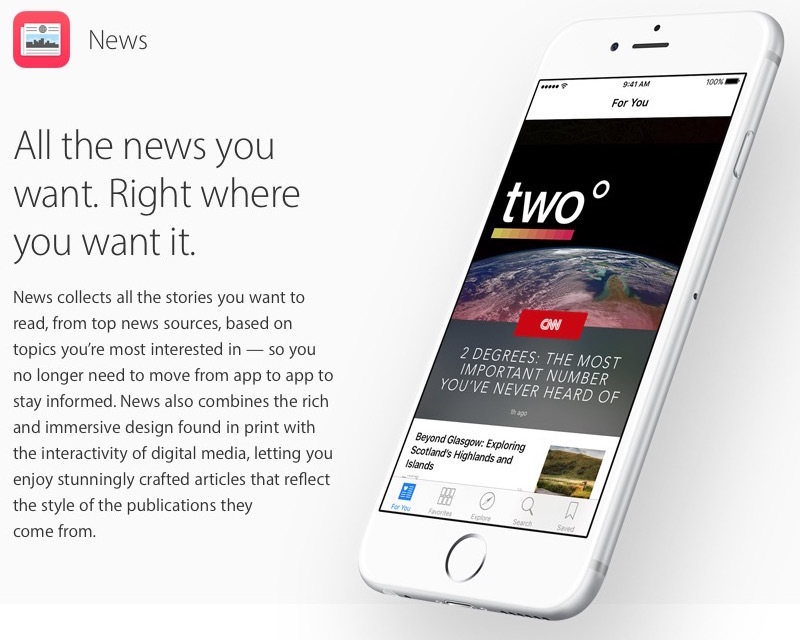 Apple News launched as part of iOS 9, offering a one-stop location for users to keep up on news on various topics from a number of different sources. Any publication with an RSS feed could apply to be included in Apple News, but initially only a select group of major publications was given access to the Apple News Format that allowed for much richer content to be included in their feeds. Since Apple launched the app in September, it has attracted more than 100 major publishers as partners, including this magazine’s Web site. What the new launch means is that anyone—from individual bloggers to smaller, independent news organizations—will be able to edit and deliver their stories, videos, galleries, and audio in the Apple News format, with Apple News’s reach. As highlighted by Wired, Apple is also rolling out a new analytics dashboard for Apple News publishers, giving them access to data on users viewing their content on the platform. Apple should be updating its News Publisher portal shortly with details on how publishers can take advantage of the new format for maximum impact. Until they stop allowing articles that are blurbs that tell you to open the article on the web, I will not use this app. How about expanding to other countries? How about you work on making News NOT the slowest-loading app on my phone, then we can talk about adding features? already too much content as it is. am i the only one getting overwhelmed with all the different news and categories and whatnot left and right so i end up not reading anything at all? I use this app several times every day. I hope a version is coming for my MAC. I still use Flipboard too since News is only on my portables but so far so good. I don't need it pointed out that its not perfect but really, its plenty good for the times I use it in the morning with coffee and in the afternoon waiting on kids. Combined with the fact that some of these same "open on the web" articles don't even load properly when you DO open them, I stopped using this app months ago. Settings-News-Show Story Previews...turn it off. It will load the story right in the News app. Not interested in an Apple news App. Apple is just too darn set on imposing its will on all things Apple to be able to trust that the news is not filtered based on Apple's idea of political correctness. MacRumors should start using Apple News as well! Apple today opened up its Apple News Format to all publishers, giving independent publishers and individuals tools to offer rich media content within the Apple News app for iOS 9, as noted by Vanity Fair ('http://www.vanityfair.com/news/2016/03/apple-news-opens-to-publishers'). Apple News launched as part of iOS 9 ('https://www.macrumors.com/2015/09/16/inside-ios-9-apple-news-app/'), offering a one-stop location for users to keep up on news on various topics from a number of different sources. Any publication with an RSS feed could apply to be included in Apple News, but initially only a select group of major publications was given access to the Apple News Format that allowed for much richer content to be included in their feeds.As highlighted by Wired ('http://www.wired.com/2016/03/apple-wants-publishers-join-apple-news-look-good-now/'), Apple is also rolling out a new analytics dashboard for Apple News publishers, giving them access to data on users viewing their content on the platform. Apple should be updating its News Publisher portal ('https://developer.apple.com/news-publisher/') shortly with details on how publishers can take advantage of the new format for maximum impact. Poorly written blurbs and click bait haven't made Apple News a go-to app for me yet. I've never had any issues loading the app..